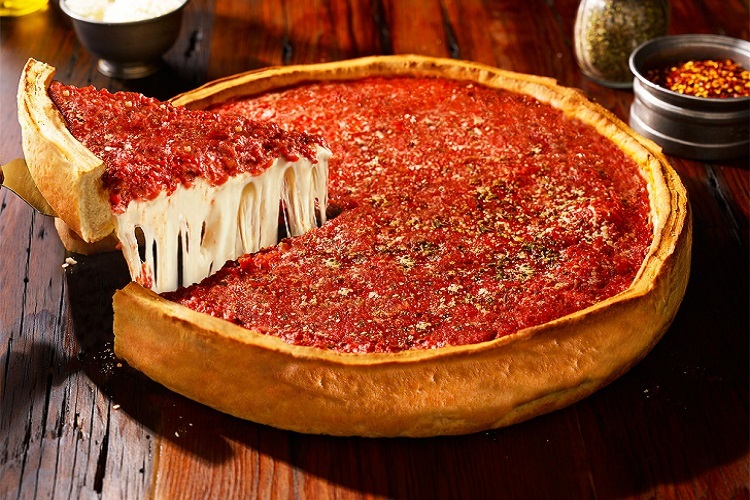 Come celebrate the 75th birthday of original Chicago deep dish pizza with FREE PIZZA! All month long, Pizzeria Uno (located at 29 E. Ohio St.) will be giving away 7,500 free slices of pizza throughout December. The Uno story begins in Chicago in 1943 when Ike Sewell developed deep dish pizza and opened a new type of restaurant at the corner of Ohio & Wabash. It was here that Ike served a pizza unlike any that had been served before. Buttery ‘out-of-this-world’ crust that had a tall edge like a fruit pie. He created a recipe that combined authentic Italian spices and quality tomatoes with more cheese than people could believe and then baked it for nearly an hour. When people tasted it, they wanted more of the same and the lines have been forming ever since to get into the restaurant. You’ll be happy to know that all this FREE PIZZA will occur at locations all over the city, including Maggie Daley Skate Park, the entrance to the Lincoln Park Zoo for Zoo Lights, Grand & State Red Line, train commuter stations, the Chicago Theater, Macy’s holiday windows and more and they will be posted daily at noon on their Facebook page. The Uno team will be out and about at lunch time and on weekdays from 4 to 7 p.m., so keep your eyes peeled.